Beni Lörtscher from Switzerland kindly sent the following report of his 1.4 meter span Topp-Rippin model. His own model is now under construction, but he has flown a similar model of a colleague. It flies extremely well, it is very fast, it is extremely stable ("flies like on railroad tracks"), responds in a harmonic way, and flies standard aerobatics maneuvers very well. 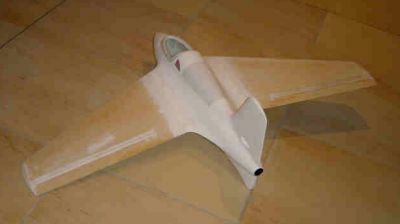 It's one of the best RC aircraft he knows. Contrary to the excellent performance, the building process is not so much fun. 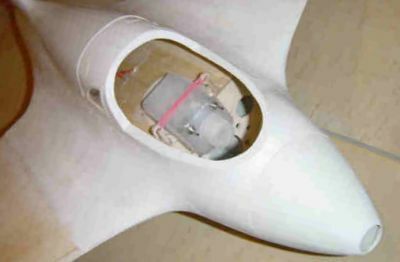 The quality of the glass-fibre fuselage parts is bad, and the fuselage-wing fit requires lots of fiddling to get it right, and to make it strong enough. But it is all worth it in the end. A rear view, showing the wooden wings with near full-span elevons (ailerons-elevators). The weight with Beni's equipment is 2.8 kg. The engine will be a Rossi 60 of 2.8hp. Beni reports that this engine produces a very loud sound; you can hear it coming from a distance of 2 kilometers. It's almost like an F1 race car. This will make local people not very happy, but it is a lot of fun!